The horses at Ballentine’s Horse Heaven received shots every year to protect them from a variety of ailments. Socks and Shadow waited in their stalls. Donna Horton and Ann Shaffer passed the time brushing down their horses and chatting about local news. 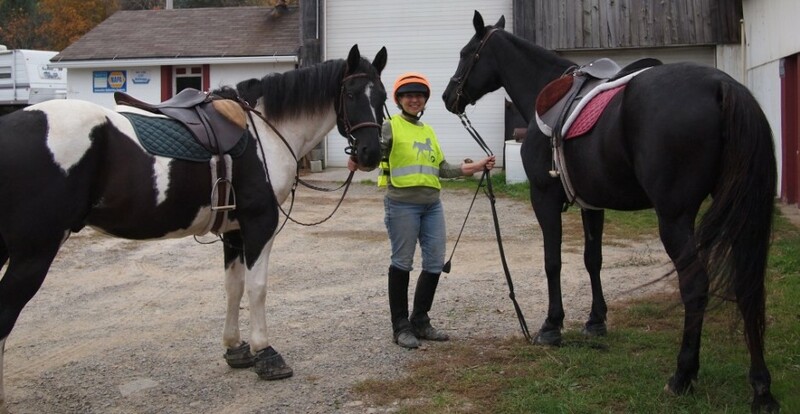 It wasn’t long before Dr. Andy Wilcox from Laurel Hill Veterinary Services arrived at the stables for a farm call. He backed his vehicle up to the front of the barn, and opened up the back of his truck which had all his instruments and medicines. As we watched, he prepared shots for Socks and later Shadow. The old adage, an ounce of prevention is worth a pound of cure, is as true today as it has ever been. 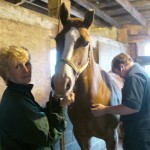 Each spring horses receive vaccinations to prevent the occurrence of deadly diseases which plaque the equine community. Dr. Wilcox prepared a number of shots. The first shot was 5 in 1: Rabies, West Nile Virus, Tetanus, East and West Encephalitis. The other shots were for Equine Rhinopnemonitis/Infuenza, also called Flu Rhino. As a standard, horses receive these shots once a year to avert serious diseases. Rabies in Latin means “madness”. The disease has been known and feared by mankind for thousands of years. The virus is transmitted through saliva from an infected animal, usually from a bite. Horses get the disease by being bitten or eating food which has been infected with the virus. Any warm-blooded mammal can get and transmit the disease. Once an animal or person contracts rabies, the virus travels to the brain. It takes awhile before signs of the disease appear in the victim, but once the virus reaches the central nervous system the infection is untreatable and death occurs within a few days. The early symptoms of rabies are malaise, headache, and fever which progresses to acute pain, violent movements, uncontrollable excitement, depression and hydrophobia. Dogs receive a vaccine for rabies and a booster shot every 3 years; however, horses are given the shot every year. Occasionally, a horse is bitten by a wild animal, usually a fox, skunk, raccoon or bat. At that point, the horse is given a booster shot even if the animal has already been vaccinated, just to be on the safe side. As everyone who enjoys the outdoor environment knows, mosquitoes are everywhere in summer. The insect is prevalent in regions with high humidity and rainfall. Mosquitoes lay their eggs in standing water which collects in old tires, gutters, birdbaths, ponds and swampy areas. The mosquito is a notorious carrier of diseases such as West Nile Virus (WNV), East and West encephalitis and malaria to name a few. When the Northern House Mosquito feeds on birds ( primarily crows and blue jays) infected with West Nile Virus, the insect acquires the virus. Once the mosquito has the virus it spreads the disease everytime it feeds on the blood of people or animals. WNV can cause encephalitis or meningitis which is an infection of the brain and spinal cord. Prior to 1999, West Nile Virus was only found in Africa, Asia, and southern Europe; currently, the disease has spread throughout the US. Once a horse has acquired the WNV there is no specific treatment; therefore, vaccination is recommended. The source of Tetanus or Lockjaw is found primarily in soil, dust and manure; however, the spores can be found anywhere. The bacteria once introduced into living muscle tissue through a scratch or wound produce toxin which affects the brain and nervous system. The toxin result in muscle stiffness, muscle spasms, and serious breathing problems. As the disease progresses muscles become rigid and convulsions, paralysis and death may occur. Once the horse has contracted the disease there isn’t much that can be done; therefore, prevention is the best cure. East Equine Encephalitis (EEE) is sometimes called sleeping sickness. The virus infects a wide range of animals, including mammals, birds, reptiles and amphibians. Similar to West Nile Virus, mosquitoes become carriers after feeding on infected birds. The virus increases throughout the summer as more and more animals are infected. Once infected, the virus travels through the lymphatic system to the lymph nodes. Symptoms begin with a high fever, signs of nervousness, sensitivity to sound, excitement and restlessness. As the disease progresses, brain lesions develop causing drowsiness, drooping ears, inability to swallow , restlessness, and other signs of disorientation. The mortality rate in horses is 70 to 90%. Paralysis and death occur 2 to 4 days after symptoms appear. There is no cure for the disease; however, EEE is easily prevented through vaccination. Rhinopneumonitis is caused by equine herpes virus which almost all horses acquire during the first months of life. Once the horse is infected, the virus hibernates in the lymph nodes of the respiratory system where it lives throughout the horse’s life. The horse’s immune system keeps the virus in check. When the immune system is compromised the virus is released resulting in inflammation of the mucus lining in nasal cavities and lungs. The disease is rarely fatal, but can reoccur. Equine influenza is easily transmitted from horse to horse and has a short incubation time of 1 to 5 days. The symptoms are fever, hacking cough, runny nose and reluctance to eat or drink. The horse usually recovers within 2 to 3 weeks. The Flu Rhino shot vaccinates for both diseases. I watched Dr. Wilcox carefully inject Socks with vaccine. He administered the first shots into the horse’s chest muscles. Through movement and exercise, the horse would eliminate whatever stiffness occurred as a result of the shot. He finished with Socks and moved on to Shadow. “Is rabies common in horses?” I asked. “I haven’t seen a case; most horses receive the vaccine for rabies. Many years ago, before I became a vet there was a case of a raccoon biting a horse. 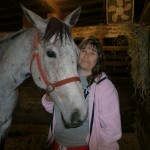 The horse was given a booster shot just to be on the safe side and was fine,” replied Dr. Wilcox. “Why did you choose to become a vet,” I asked. “I became a vet in 2005, basically following in my father’s footsteps. Before I became a vet, I helped my Dad out on farm calls. When he retired, I took over his practice,” replied Dr. Wilcox. Dr. James G. Wilcox graduated from the University of Pennsylvania vet school in 1968 and attended a yearlong internship there. Dr. Keeler, the local vet who lived just up the street from James, unexpectedly passed away. James returned to East Smithfield to fill the need for a vet in the area. He purchased equipment, supplies and rented Dr. Keeler’s old office. In 1980, he moved and worked out of his garage until 1988 when he purchased land and built the Laurel Hill Clinic. 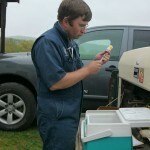 His son, Andy, helped by assisting with farm calls. As the years passed he hired other vets to work in the practice. James witnessed a change in the community as small farms were sold and dairy herds deceased in number. When he started his practice, approximately 90% of his clients were dairy farmers. Currently, that number has dropped to about 30%. Conversely, his small animal practice has increased. Dr. Andy Wilcox joined the practice in 2005 when he graduated from the University of Pennsylvania vet school. Dr. James Wilcox retired and left the practice to his son.Laurel Hill Veternary Services cares for all types of animals; primarily cows, horses,dogs and cats. “So where do you go from here?” I asked. “I have other farm calls, mostly dairy farms. There are 2 other vets at the clinic. We rotate between farm calls and staying at the clinic to help small animal owners with their dogs and cats. I’m usually on the road 2 to 3 days a week. I travel in about a 50 mile radius of the clinic,” replied Dr. Wilcox. The late morning sky remained grey. Donna turned Socks out to pasture and returned to work. The temperature began to warm as the clock ticked passed 10:00. Ann and I watched Dr. Wilcox pull his truck out of the driveway and head into the countryside to treat other horses and cows. This entry was posted in Uncategorized and tagged Dr. Andy Wilcox, Dr. James Wilcox, East and West Encephalitis, equine diseases, Equine Rhinopnemonitiis, equine shots, Laurel Hill Veternary Services, rabies, tetanus, West Nile Virus. Bookmark the permalink.